Sid Lowe is a Madrid-based journalist who writes regularly for The Guardian and contributes to other broadcast and print media in Spain, the United Kingdom and the United States. He completed his PhD at the University of Sheffield and has studied at the University of Oviedo. He has lived in Madrid for almost a decade. Spain’s first democracy was announced to popular jubilation in April 1931, a new dawn ushered in without a single shot being fired. Yet just over five years later the country was plunged into a brutal civil war that bequeathed hundreds of thousands of deaths and an authoritarian dictatorship under General Francisco Franco that lasted almost forty years. Catholicism, War and the Foundation of Francoism analyses Spain’s dramatic political shift, reassessing the role of the right as it mobilised against the Second Republic, swinging from ostensibly –moderate– Catholic conservatism to fascist violence. 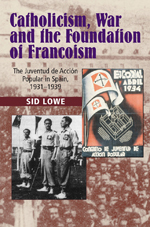 By providing the first detailed study of the uniformed, paramilitary Juventud de Acci–n Popular (JAP), Sid Lowe challenges the historiographical orthodoxy on Spanish fascism and assumptions about the role of the hegemonic right-wing party during the Republican years, Jos– Mar–a Gil Robles’s CEDA. Drawing on a wide range of previously uncovered primary material, he demonstrates that much of the parliamentary right, its leadership included, abandoned the legal road to power when it could no longer use democracy as a Trojan Horse with which to conquer the state. It throws vital new light on the conspiracy to destroy the Republic, the Nationalist war effort, the creation of the new state, and the true social and political origins of the Franco r–gime. Dr Lowe fuses social and political analysis to demonstrate how, at the grass roots of Spanish society, the political culture of the long-lived Franco dictatorship was crucially instigated by the radical, mass Catholic youth movement, JAP. Lowe’s originality lies in the fact that his analysis pinpoints the moment and demonstrates the mechanism by which radical Catholics in Spain became fascists. In doing this he has cut the gordian knot that inhibits much of the conventional historiography on the Spanish Catholic right during the 1930s. This study of the genesis, evolution and activities of the largest mass movement of the right in 1930s Spain, the Juventud de Acción Popular, is a remarkably sophisticated piece of work. It is based, in the first instance, on an impressive array of primary sources which have been assembled from virtually every one of Spain’s fifty provinces. Assembling this entirely new material has, in itself, been an altogether significant achievement involving painstaking detective work. The author’s work has thereby filled the gap left by the destruction of the organisation’s records during the Spanish Civil War. The book is also invaluable for its exhaustive examination of the extensive secondary literature on the subject of the political right before and during the Spanish Civil War. The scholarly credentials of the author are thus impeccable. The originality of the documentation unearthed gives the book considerable freshness. However, even more striking is the intelligence and maturity with which this hard-earned material is handled. ... The youth movement of the mass Catholic party, Acción Popular (which later in 1933 was expanded to become the Confederación Española de Derechas Autónomas or CEDA), was one of the most crucial protagonists of the breakdown of political co-existence in the Second Republic and went on to play a major role in the coalition of right-wing forces that won the war. The book clearly analyses the development of the Juventud de Acción Popular, its fascist-like cult of personality around the CEDA leader, José María Gil Robles, the internal contradictions between advocates of moderation and enthusiasts for violence, the relations between the JAP and other sections of the Spanish Right and its eventual fusion with the fascist Falange. This fusion was the prelude to JAP members playing a crucial role on the Francoist side in the Spanish Civil War, as front-line militias, in the ‘dirty work’ of the repression of liberals and leftists and also in the articulation of the future Francoist dictatorship. ... The social and political analysis underlying Sid Lowe’s work demonstrates how much of the mass support and the political culture which permitted the long-term survival of a dictatorship imposed by military action derived from this radical, mass Catholic youth movement. What is striking is that the author effectively demonstrates why many on the left in Spain believed that both the CEDA and the JAP were fascist movements. In reconstructing the mass mobilisation of Catholic Youth, Dr Lowe locates Spain’s ‘fascist moment’, showing how the dynamic introduced by the JAP changed the politics of the right beyond recognition. In demonstrating how radical Catholics in Spain became fascists, Dr Lowe undermines the conventional wisdom of much of the historiography on Spain in the 1930s which has limited analysis of Spanish fascism to the initially marginal and subsequently subordinate party, the Falange. ... Rather, Sid Lowe conclusively demonstrates that Spain’s Catholic youths flooded the JAP because they were attracted by its fascist rhetoric and its rejections of ‘old’ politics. In that sense, the JAP played a key role in the polarization of politics during the Second Republic and thus also in fomenting civil war. Moreover, his account of the fusion with the Falange is startling original showing how the latter benefitted from the JAP’s masses and thus acquired the radical mobilisation of which it had been incapable. Moreover, what Dr Lowe contributes on youth politics in 1930s Spain links not only with recent Spanish work on anarchist, Socialist and Communist youth politics but also with European research which is similarly exploring the often violent role of youth movements in the 1930s. In telling this story, perceptively and, indeed, with real narrative verve, Sid Lowe explains as never before the transition from apparent moderation to explicit violence that took place in the wake of the right’s defeat in the elections of February 1936. The result is a beautifully written work which is a major original contribution to the historiography of the causes, the course and the consequences of the Spanish Civil War. When it comes to civil war, it takes two to tango. In the latest addition to Sussex University’s fine series on contemporary Spanish politics, Sid Lowe fills something of an historical void by offering a fresh examination of the right in the years leading up to the Spanish Civil War, providing a major reinterpretation of the basis of Spanish Fascism. ... Though the JAP was only in existence for five years, it played a key role in radicalising the right, eventually providing the core of Franco’s fascist regime. Starting in the shadows of the old Spain, with the JAP’s Nuremburg-like rally at Phillip II’s El Escorial, Lowe vividly describes the soaring military rhetoric and political dealing of what was more than just a youth movement. Lowe argues it was a uniquely Spanish fusion of conservative Catholicism and fascism. While many members had concerns over the totalitarian nature of Nazi Germany, seeking to preserve their own Catholic liberties, their expressed aim of using the state to annihilate socialism showed there was little fear of state power. ... Lowe places both movements in the context of a Manichean battle between Spain and anti-Spain. Looking closely at contemporary publications, speeches and extensive primary literature, he argues that the JAP provided a drive and purity to the politics of its amorphous political parent. Thanks to this, CEDA’s policy of accidentalism – working with the Republic – was nothing more than a political tactic. When faced with electoral defeat in early 1936, many japistas were more than willing to join the military conspiracy against the Republic. Lowe highlights their importance – rather than the Falange – as auxiliaries linking the populace to the army. This is a fascinating and illuminating analysis of how the Spanish Civil War came about. The Juventud de Acción Popular (JAP), youth wing of one of the parties comprising CEDA [Confederación Española de Derechas Autónomas], and, from summer 1934, under the ‘supreme leadership’ of Gil Robles, has never been the object of a full-length study before. It was important for this historiographical shortfall to be addressed because the JAP was a crucial part of the mass mobilization, and, Lowe argues, the fascistization of the Catholic right in the 1930s. Nevertheless, formidable obstacles await any historian of the movement. The decline and ignominy that followed CEDA’s defeat in the February 1936 elections entailed for the JAP a greater subsequent eclipse in terms of popular remembrance, Nationalist mythologizing and academic historiography than for other forces later subsumed within Franco’s Movimiento in 1937: there are no JAP ‘veterans’ associations; Lowe canvassed for ex-JAP interviewees without great success; and the absence of an official CEDA archive, let alone a JAP one, makes the task yet harder and slower. Lowe has painstakingly drawn on a wide range of local and national archives, and a vast amount of reading and research, to reconstruct the political complexion and vicissitudes of the JAP from its formation in 1932 to its dissolution in 1937. His work makes a substantial original contribution to our understanding of 1930s Spain, and particularly to analysis of the development of fascism over the course of the Second Republic. ... The first chapter charts the emergence and trajectory of the JAP until the October 1934 revolution, in which the JAP played a significant strike-breaking role by keeping vital services operating. Lowe focuses sharply and in a nuanced way on the issues lying at the heart of JAP’s programme: youth, discipline, history, raza and empire, nationalism and masculinity. His analysis shows beyond doubt that previous (shorter or partial) studies of the JAP seeking to distance it from fascism are simply not tenable. This and the following chapter, which follows the JAP’s continued growth and increasing political presence after its success as an civilian auxiliary force in October 1934, demonstrate carefully how the values of Spanish Catholicism became interwoven with a palingenetic, imperialist ultranationalism and new mass mobilization techniques to produce a deeply fascistized Catholicism that Gil Robles (whose CEDA was hobbled by its alliance with more traditional conservative parties) was able to instrumentalize with great effectiveness. The JAP acted as a political vanguard for Gil Robles: unhindered by the legalism and compromise of parliamentary coalition, the JAP’s rhetoric, the political theatre of its rallies and its pre-election campaigning were all able to give a good indication of Gil Robles’ intended destination had CEDA been able to capture decisive state power legally. Lowe’s careful analysis of the JAP’s development before 1936 here allows him to argue persuasively in subsequent chapters that one of the reasons the Falange Española did not take off before the July rising was not, as Payne has argued, that there had been no previous real constituency for such a movement, but instead that the JAP had already occupied the Falange’s political space and enlisted its potential supporters. As the final chapters show, JAP members served, to use the organization’s own words, as ‘selfless auxiliaries’ in the rising and ensuing war. As Lowe makes clear, the problem with such selflessness was that it created the conditions for JAP’s own political (but not ideological) obliteration; unlike the Falange, which fought to retain its political identity – for all that it was later eviscerated under Franco – JAP’s very willingness to serve allowed it to be subsumed completely within other forces leading the rebellion. Lowe argues convincingly that the JAP’s biggest hindrance to political survival was not its ideology but its tactics. As he notes, ‘The New State was largely what the JAP had always wanted; the price it paid was its own disappearance’ (p. 231). ... Lowe makes a persuasive case for the importance of the role that the JAP’s fascistized Catholicism played in the breakdown of the Republic, fomenting the domestic conditions that would allow a right-wing military rising to stand a feasible chance of success in the age of mass mobilization; as the Sanjurjada had shown, such conditions did not exist just four years beforehand, and the JAP was a decisive catalyst in the exhaustion of pluralist coexistence within the Republic. This carefully researched, well-organized and penetratingly-argued study expands our understanding of the political and social bases of fascism in Spain: study of these issues rarely ventures far beyond the Falange Española. Lowe’s excellent study will be essential reading for any scholar of the Republic or the Civil War.